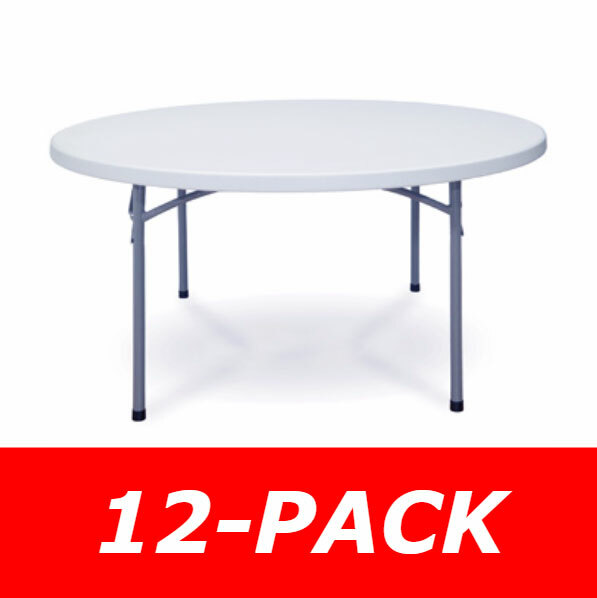 Price includes shipping for this 12 Pack of Round Folding Tables when shipped to the 48 United States. Model ACT-60R tables are also available in 5-pack Round Folding Tables as well. 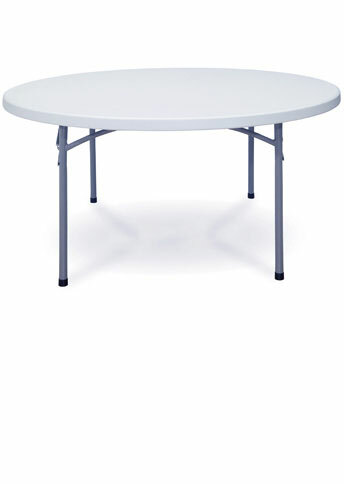 ACT folding tables - 60" round are constructed of high impact polyethylene and are stronger, lighter, and more durable than wood. They will not crack, chip or peel, and are built for indoor and outdoor use. These ship from California and take about 7 days to arrive. They are too large for UPS or FedEx as they ship via LTL Freight Companies. 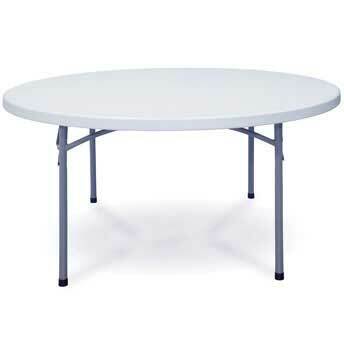 The 60" round folding tables are approximately 30" tall and weighs about 45 lbs. Though These Tables Are Designed Primarily for Commercial Applications They Are Affordably Priced. ACT Indoor/Outdoor Round Folding Tables Have Cross Members Set Higher Than Most Competitors to Allow For More Comfortable Seating Around the Table. Competitive Edge Products, Inc. is an authorized retailer of the ACT-60R 5 foot 60 inch round banquet folding outdoor table manufactured by ACT Los Angeles, CA. This table is designed to support evenly distributed weight. These round folding tables differ from Lifetime Round Folding Tables of similar size in the design of the legs. 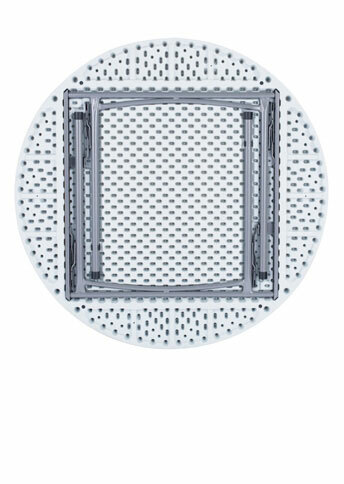 Lifetime Tables that are 60 inches in diameter have an bracket that extends between the two sides of legs. This design feature is meant to provide added support to the size of the table top, but also creates a bad legroom in the process. ACT Round Tables do not implement any such design, but instead provide a great steel support structure for the table top. This design allows more leg room for people while they sit at the table. Great service and quick delivery time. Q: Is this color gray granite the same as the white granite tables I have currently? Will they match? A: This color-gray granite-is not the same as the white granite tables manufactured by lifetime. They are close, but if you have them side-by-side you will notice they are not a perfect match. Fast Shipping: Orders for the MPDholdings Bm-60r (12 Pack) generally leave the warehouse within 2-4 business days. Delivery Details: This product ships directly from the warehouse in Santa Fe Springs, CA. This item generally ships via a curbside delivery through an LTL carrier (too big for UPS and FedEx). The customer must be present to sign for the order. The freight carrier is instructed to contact you prior to delivery to set up a delivery appointment. 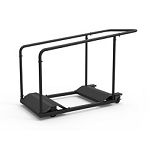 Local Pickup Option: This item may be available for local pickup in Santa Fe Springs, CA. If you are interested in picking it up locally contact our customer service for a super cheap pickup quote at 866-308-5484. Dimensions: 61" x 61" x 30"